And so to conclude our culinary trip to Turkey, we couldn't have a Turkish feast without some stuffed vegetables. 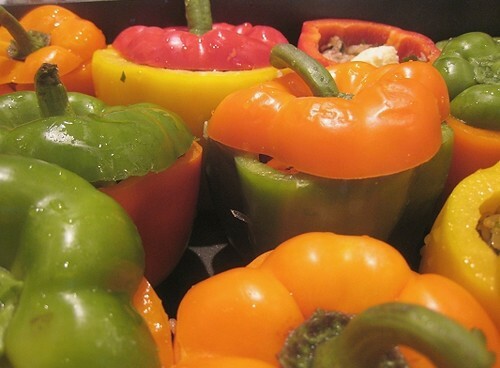 Stuffed vegetables seem ubiquitous in Middle East and Mediterranean cuisine, and to get a good representative range of Turkish dishes, we knew that we had to overcome our own struggles with stuffing things. Of course, we had to search for the path of least resistance. I knew there was absolutely no chance of us doing anything as difficult and time-consuming as stuffing grape leaves, so I didn't even broach the subject with TS. TS is even more resistant to stuffing than I am. "Perhaps we can stuff some of the zucchinis." "No. I don't want to stuff." "To make it easier, we can do it horizontally, aka the boat-style of stuffing." "But no, not boat. The vertical way of stuffing them seem more authentic." "You have to hollow out the insides, and then what are you going to do with all of the insides?" "Maybe the Turkish people have it right. You have to hollow out the inside of the zucchini. I'm starting not to like zucchini because it seems like the centers have been too "wet" and "watery." "What are you going to do with the insides? Seem like a huge waste." "As I said, soup, I guess. But I don't know. . .Seem like a big undertaking now. Maybe just throw out the centers then. Although perhaps we can just stuff 3 zucchinis. Cut 4 per zucchini, so it's only 12 pieces to stuff." "Well. . .I suppose if it's just 12 pieces, it doesn't seem too bad." "Perhaps when zucchinis are stuffed, perhaps they taste better. Greater than the sum of its parts." TS just shrugged, seemingly unconvinced. I suppose she doesn't need to get convinced. If the order is just 12 pieces of zucchini, I can stuff them myself. I started to work on the stuffing. I took approximately a pound of ground beef and 2 cups of uncooked rice. I minced some onions using the food processor, added parsley and mint. In goes the hot paprika, dried oregano, salt and pepper. When I looked at the bowl, it seemed like a lot of stuffing for 12 pieces of zucchini. I imagined myself stuffing more and more zucchinis, and more and more zucchinis, and more and more zucchinis. Since one zucchini piece probably needed just one tablespoon of stuffing, I would be stuffing more than a hundred pieces to use up the mixture in the bowl. Time to regroup and find a contingency plan. Fortunately, the bell peppers I got that day were on the biggish side. I think the Turkish aesthetic would require smaller peppers (I'm thinking almost the same size as a fourth of a zucchini), but that's something we just have to forego for now. Given the size of the peppers I got that day, I only needed about 20 of the bell peppers to use up all of the stuffing mixture, stuffing them about 3/4 full. I kept the tops of the bell pepper so they can be the hats and it's kind of cute to mismatch their hats like this. We didn't have a pot large enough to hold the peppers in one layer, so I used this large roasting pan. To cook them, I dissolved some tomato paste in hot water and poured it around the peppers, until the water was halfway up the peppers. I added little nubs of butter to the peppers and drizzled olive oil over the top. I placed the giant roasting pan over two burners, brought the water to a boil, then lowered the heat to medium (not low). TS then covered the pan with foil. 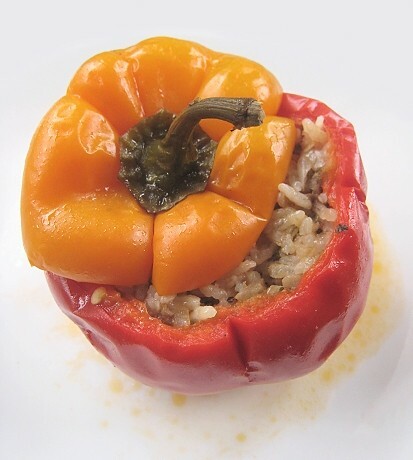 When the peppers were finished cooking, the rice had expanded and the stuffing filled up the whole pepper. The flavours here are familiarly Mediterranean, with the oregano, parsley, and mint. While I'm not usually a fan of too-soft foods, I really liked how soft everything is here: the peppers, the rice, the beef -- they were all so yielding. The butter added a nice richness to the dish. There's something very filling, very satisfying about these stuffed peppers -- and maybe I'll try stuffing some zucchini next time. Zucchinis don't have skins, which was the only thing that kind of detracted from the whole stuffed pepper experience. Mix all of the stuffing ingredients until it comes together and season to taste. 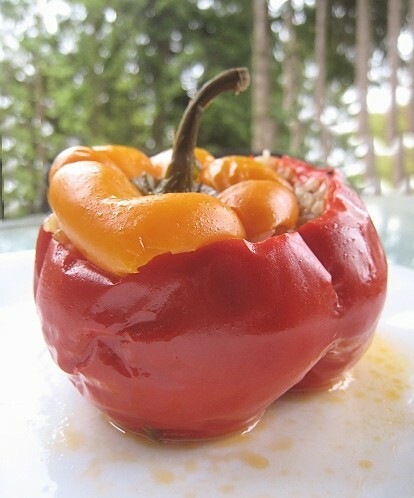 Cut off tops of bell peppers. Save the tops: this will be the "lid" for each stuffed pepper. 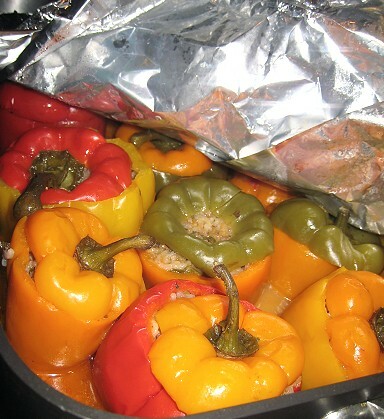 Make some slits into the peppers so the inside can cook evenly. Fill the pepper about half way to about two-thirds of the way up (the rice will expand when cooked). Add a small piece, approximately 1/4 tsp, of butter to each pepper. Cover with the tops. Mix some tomato paste with water and pour water into the pot until water comes halfway the peppers. Drizzle with a touch of olive oil. Bring the water to a boil and cook on medium heat for approximately 45 minutes, or until the rice has expanded. I love all the colorful peppers! Looks delicious as usual! 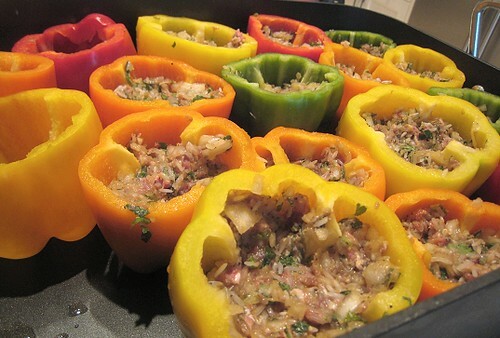 Now, stuffed bell peppers... those bring back memories of my youth. These definitely are NOT my mom's stuffed peppers, but those photos give me the same mouth-watery tingle as the smell of her kitchen when I was ten. YUM. Your lead photo is wonderful! I am, however, always taken aback by the amount of rice or bulgur used to stuff peppers. wonderful post! I love these little bright peppers. I made some today and have them slow cooking as I type this. Mine are full of ground beef and spanish rice with cheddar cheese. I love playing around with the inside mixture! Yours are great looking and you are cooking for an army! I didn't see it at all but JS pointed it out to me as well. "Fat pants" stuffed pepper, haha. That is a great dish I guess I should travel to Turkey. Man, there are a lot of things to discover on that piece of land. Thanks for visiting & commenting!